Occupy Oakland will reconvene today at 4pm Pacific at the Oakland City Library. Live tweets from Occupy Oakland will be available at www.AnswerCoalition.org at that time. The report below was submitted by an ANSWER activist and Oakland occupier. 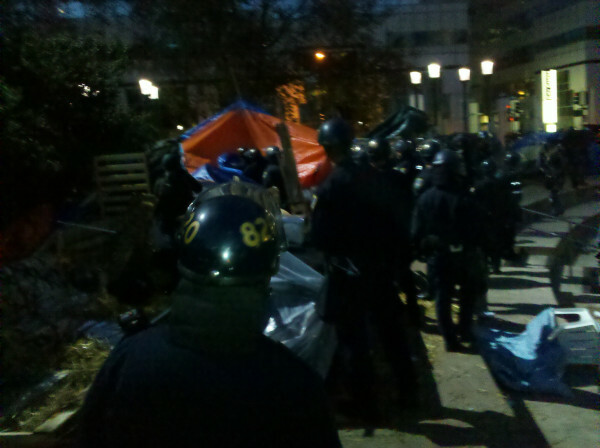 Nine police agencies demolished the Occupy Oakland camp this morning in yet another attempt to silence the 99%. About 500 people demonstrated during the night from 10pm to 5:30am in defense of the occupation. Police surrounded Oscar Grant Plaza and tore apart the camp in the early hours of the morning, stomping on everything and showing complete disregard for the belongings of the peaceful demonstrators. They destroyed the facilities set up by camp members to provide basic services that the government won't provide. Not even the large kitchen that provided food for the occupiers was spared. Occupiers remained steadfast as the police carried out their premeditated, highly coordinated assault on the camp. They are calling on people in the Bay Area to join together at 4pm Pacific Time today at the Oakland City Library. Yesterday, Scott Olsen, the Iraq war veteran who was shot in the head by a police tear gas canister three weeks ago in Oakland, wrote online that he has a lot of work to do in rehab after his "freedom of speech was quite literally taken from [him]," but he is confident that soon enough he'll see us in our streets. We will be there. Our movement will not be silenced. Occupy Oakland will reconvene today at 4pm Pacific at the Oakland City Library. Live tweets from Occupy Oakland will be available at www.AnswerCoalition.org at that time.